What Day Of The Week Is September 30? 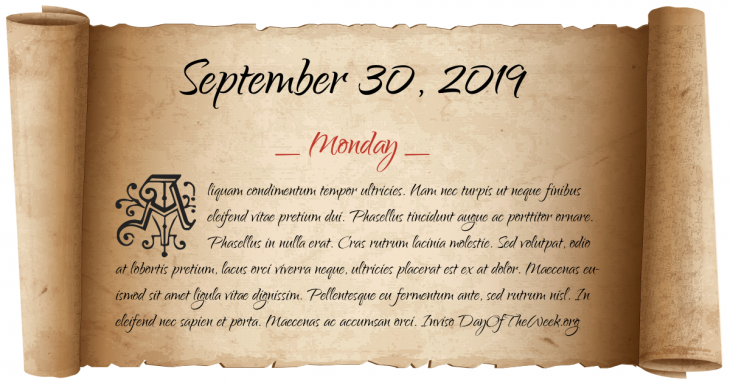 September 30, 2019 is the 273rd day of the year 2019 in the Gregorian calendar. There are 92 days remaining until the end of the year. The day of the week is Monday. The Real Academia Galega, Galician language’s biggest linguistic authority, starts working in Havana. Mexican-American labor leader César Chávez founds the National Farm Workers Association, which later becomes United Farm Workers. BBC Light Programme, Third Programme and Home Service are replaced with BBC Radio 2, 3 and 4 Respectively, BBC Radio 1 is also launched with Tony Blackburn presenting the first show. Who were born on September 30?